This is not the first elder tree to lose out to developers. In 1989, activists fought to protect a stand of cottonwoods where the (failed) Riverfront Mall now stands. And in 2003 there was a heated battle between developers of the Hobbs-Taylor building and a coalition of neighbors and activists about the fate of giant elm near the corner of 8th & Rhode Island. Developers claimed that the tree was dying anyway, was dangerous and would cost too much to save. Sound familiar? Folks hoping to save the tree rallied, made t-shirts, brought in the media and eventually set-up an encampment around the tree to ensure it wouldn't be cut-down by surprise. 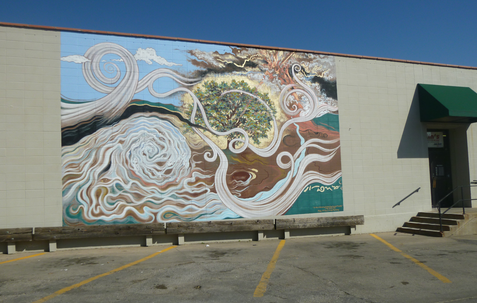 A mural on the south side of Cottins Hardware by Ardys Ramberg and Missy McCoy memorializes the tree and the fight to save it. There are other trees, regular everyday trees that don't have advocates like the elders. They disappear daily at the whim of property owners, utility companies and the occasional big wind. One of these anonymous trees was in the line of sight looking out the window of the Lawrence Percolator in 2009 (before the Marriott). For the exhibition, "Trees I Have Known," I created the "Illuminated Nearby Tree," which functioned as a template for people to recount their memories of trees by writing short stories within the illuminated branches. Before the show was over, the tree it was based on was gone too, a inconvenience to builders of the new apartment building and fitness club.